To take a snapshot in Second Life, click the Snapshot button (shown at left), choose World > Snapshot, or press Ctrl-Shift-S. The SNAPSHOT PREVIEW window opens. Post the image to your Second Life profile feed. Save the image to your inventory for a L$10 fee. With any of these options, click to display advanced options. Click ? in this window for additional help information. When you take a snapshot, your avatar performs a picture-taking animation and makes a whirrr-click sound effect. For instructions on how to disable the sound animation, see Disabling snapshot sound and animation. Drag the Snapshot button to the location you want it. Important: When taking snapshots inworld that include other Residents, please be sure they have given you consent to take their photo. See also the Second Life Snapshot and machinima policy. Click Post to My Profile Feed to post the snapshot to your Second Life profile feed. You can also add a caption and the location of the snapshot if you wish. Click Email to email the snapshot to one or more people. The maximum size for a Send via email snapshot is one megabyte, or a little over 1,000,000 bytes. If you go over that, File size will turn red and you won't be able to send your email. Adjust the file size of the snapshot using the drop down menu; the manual Width and Height settings; or lower the Image Qualityslider. Click Save to My Inventory(L$10) to save a snapshot to your inventory. You will be charged L$10 for this option. Snapshots are saved to the Photo Album folder, and named based on the location where you take them. Click Save to My Computer to save a snapshot image to your computer's hard drive. Tip: To move snapshots from your computer to your inventory, choose Build > Upload Image (L$10). The image is saved to your Inventory Textures folder. Large textures can affect region performance. For best results use textures of size 512 x 512 or smaller. See the Intro to Textures video tutorial to learn more about textures. Colors: Takes normal pictures with all the color information you are seeing with your settings. Depth: Gives the per-pixel depth information of a scene. You can use this information when post-processing images in an image editor like Photoshop to create distance blur in an image when combined with the color information. Interface: The user interface of Second Life includes the Toolbar, menus, windows, and other things you use to interact and change things in the world. Select this option to show the UI in snapshots, which can be useful for making tutorials like teaching others how to build, or diagnostic purposes such as illustrating a bug. HUDs: Heads-Up Display objects are useful, but can get in the way of picture-taking. Select this option to show HUDs in the snapshot. Keep open after saving: This keeps the Snapshot Preview window open after you've saved a picture; useful if to take multiple pictures in rapid succession and pick out the best later. Freeze frame (fullscreen): Provides a fullscreen preview of the snapshot. You may notice ithe screen flashes and may look a little blocky, especially at a high resolution. Don't worry; this is just a preview, not the final result. You'll also notice the rest of the user interface (toolbar, menus, windows) disappears; the world is "frozen" and you can't move around. Don't worry about this, either: if you click the Discard button, everything will go back to normal and you can click Snapshot again. While in Snapshot Preview, the cursor turns into a magnifying glass with a + on it, so you can click-and-drag to get better shots. (It's the same as normally holding Altand clicking the mouse button.) Another important thing that might be confusing at first: whenever something changes within the "scene" (for instance, if you zoom to a different angle) and the snapshot requires an update, the screen will appear to drop away with a cool visual effect, like a Polaroid. Select Auto-Refresh to have the snapshot image automatically refresh instead of using the Refresh Snapshot button. File>Take Snapshot (and its shortcut Ctrl-Shift-S) will behave like Refresh Snapshot if the Snapshot Preview window is open. Depending on the method you selected for saving your snapshot, click Send, Upload, or Save to save your snapshot. Click Discard if you don't like this snapshot and don't wish to pay for it. The snapshot will be discarded. Note: This feature is still in development and is only available in a Project Viewer, available on the Alternate Viewers page on the Second Life wiki. For current tips, workarounds and known issues, visit the 360 Snapshots page on the wiki. Find a location where you'd like to take a 360 snapshot, then slowly look in every direction until you see that the world has fully loaded. Choose World > Snapshot or press your snapshot shortcut key. In the Snapshot window that appears, select the 360° Snapshot checkbox. Click Save to Disk. When 360° Snapshot is selected, all other options are disabled. Under 360° Capture to file, select Small, Medium, or Large to choose an image capture size. Click Save to save your 360 Snapshot to your computer. At the current state of development, viewing a 360 snapshot requires you to download and use a web viewer and a web server. For up-to-date information about viewing 360 snapshots and setting up a temporary local server on your computer, see the 360 Snapshots page on the Second Life wiki. As development continues, we will update you about 360 snapshot hosting solutions as well as other 360 compatible features. Enable the Advanced menu: On Windows, press Ctrl + Alt + D. On Mac OS, press Ctrl + Opt + D.
Choose Advanced > Quiet Snapshots to Disk. Use the shortcut key Ctrl-` (sometimes the ~ key, located next to 1 and above Tab) to save several snapshots of something quickly and easily. Then, choose File > Upload Image to upload the best shots to Second Life. This way, you don't have to pay for shots you don't want, and don't have to decide which images to keep while you're still taking pictures. Antialiasing is a way to smooth the jagged edges you sometimes see on curved surfaces inworld. 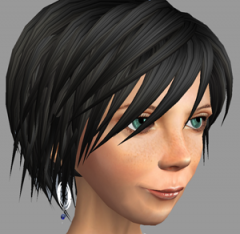 Antialiasing improves overall image quality in Second Life. For an example see the two images below. By default, antialiasing is off in the Second Life Viewer if you are using Low or Mid quality graphics; with High and Ultra quality graphics, it is on at x2 by default. Most graphics cards today support antialiasing. Click the Antialiasing dropdown and change it from Disabled to 2x or greater. Now compare the graphics: the difference should be subtle yet noticeable. Note: If you don't see a change after you restart the Viewer, it's possible your graphics card drivers are overriding Second Life's own antialiasing. Higher levels of antialiasing provide better results, but can reduce overall performance unless you have a very powerful graphics card. On slower graphics cards, antialiasing may cause a noticeable loss of performance, or even bugs or crashes—so experiment to see what's best for you. See Lighting and shadows for information on other graphics settings that may be useful when taking snapshots. Perhaps can be added to the article this great video by Torley: http://www.youtube.com/watch?v=Uj7qM1XNlWo&feature=player_embedded#!